Guildhall is a Grade I-listed building in the City of London, England. It is situated off Gresham and Basinghall streets, in the wards of Bassishaw and Cheap. The building has been used as a town hall for several hundred years, and is still the ceremonial and administrative centre of the City of London and its Corporation. It should not be confused with London's City Hall, the administrative centre for Greater London. The term "Guildhall" refers both to the whole building and to its main room, which is a medieval great hall. The building is traditionally referred to as Guildhall, never "the" Guildhall. The nearest London Underground stations are Bank, St Paul's and Moorgate. The great hall is believed to be on a site of an earlier Guildhall (one possible derivation for the word "guildhall" is the Anglo-Saxon "gild", meaning payment, with a "gild-hall" being where citizens would pay their taxes). Possible evidence for this derivation may be in a reference to John Parker, the sergeant of "Camera Guyhalde", London, in 1396. During the Roman period, it was the site of an amphitheatre, the largest in Britannia, partial remains of which are on public display in the basement of Guildhall Art Gallery and the outline of whose arena is marked with a black circle on the paving of the courtyard in front of the hall. Indeed, the siting of the Saxon Guildhall here was probably due to the amphitheatre's remains Excavations by MOLA in 2000 at the entrance to Guildhall Yard exposed remains of the great 13th-century gatehouse built directly over the southern entrance to the Roman amphitheatre, which raises the possibility that enough of the Roman structure survived to influence the siting not only of the gatehouse and Guildhall itself but also of the church of St Lawrence Jewry whose strange alignment may shadow the elliptical form of the amphitheatre beneath. 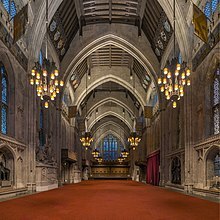 The first documentary reference to a London Guildhall is dated 1128 and the current hall's west crypt may be part of a late-13th century building. Legend describes the Guildhall site as being the location of the palace of Brutus of Troy, who according to Geoffrey of Monmouth's Historia Regum Britanniae (1136) is said to have founded a city on the banks of the River Thames, known as Troia Nova, or New Troy. The current building began construction in 1411 and completed in 1440, and it is the only non-ecclesiastical stone building in the City to have survived through to the present day. The complex contains several other historic interiors besides the hall, including the large medieval crypts, the old library, and the print room, all of which are now used as function rooms. Trials in this hall have included those of Anne Askew (Protestant martyr), Henry Howard, Earl of Surrey, Sir Nicholas Throckmorton, Lady Jane Grey, Guildford Dudley, Francis Dereham and Thomas Culpeper (lovers of Catherine Howard), Thomas Cranmer, Henry Peckham and John Daniel (members of the 1556 Dudley conspiracy), John Felton (Catholic), Roderigo Lopez, Henry Garnet (in connection with the Gunpowder Plot), and Gervase Helwys (in connection with the Overbury plot). It also played a part in Jack Cade's 1450 rebellion. The 1783 hearing of the infamous Zong case, the outcome of which focused public outrage about the transatlantic slave trade, also took place at Guildhall. On 16 November 1848, the pianist Frédéric Chopin made his last public appearance on a concert platform here. Guildhall contains memorials to Pitt the Elder, Pitt the Younger, Admiral Lord Nelson, the Duke of Wellington, William Beckford, and Winston Churchill. The Guildhall complex in c. 1805. The buildings on the left and right have not survived. This 1863 gathering at Guildhall was attended by Queen Victoria. The roof shown here has been replaced, but the hammerbeam design was not retained. The Great Hall did not completely escape damage in the Great Fire of London in 1666; it was partially restored (with a flat roof) in 1670. The present grand entrance (the east wing of the south front), in "Hindoostani Gothic", was added in 1788 by George Dance (and restored in 1910). A more extensive restoration than that in 1670 was completed in 1866 by the City of London architect Sir Horace Jones, who added a new timber roof in close keeping with the original hammerbeam ceiling. This replacement was destroyed during the Second Great Fire of London on the night of 29/30 December 1940, the result of a Luftwaffe fire-raid. It was replaced in 1954 during works designed by Sir Giles Gilbert Scott, but the original hammerbeam design was not retained. The day-to-day administration of the City of London Corporation is now conducted from modern buildings immediately to the north of Guildhall, but Guildhall itself and the adjacent historic interiors are still used for official functions, and it is open to the public during the annual London Open House weekend. Guildhall Art Gallery was added to the complex in the 1990s. Guildhall Library, a public reference library with specialist collections on London, which include material from the 11th century onwards, is also housed in the complex. The Clockmakers' Museum was previously located at Guildhall but as of 2015 has been relocated to the Science Museum. The marathon route of the 2012 Summer Olympics passed through Guildhall Yard. Two giants, Gog and Magog, are associated with Guildhall. Legend has it that the two giants were defeated by Brutus and chained to the gates of his palace on the site of Guildhall. Carvings of Gog and Magog are kept in Guildhall and 7-foot high wicker effigies of them donated by the Worshipful Company of Basketmakers in 2007 lead the procession in the annual Lord Mayor's Show. Early versions of Gog and Magog were destroyed in Guildhall during the Great Fire of London. They were replaced in 1708 by a large pair of wooden statues carved by Captain Richard Saunders. These giants, on whom the current versions are based, lasted for over two hundred years before they were destroyed in the Blitz. They, in turn, were replaced by a new pair carved by David Evans in 1953 and given to the City of London by Alderman Sir George Wilkinson, who had been Lord Mayor in 1940 at the time of the destruction of the previous versions. Guildhall hosts many events throughout the year, the most notable one being the Lord Mayor’s Banquet, which is held in honour of the immediate-past Lord Mayor and is the first to be hosted by the new Lord Mayor of the City of London. In keeping with tradition, it is at this Banquet that the Prime Minister makes a major World Affairs speech. One of the last acts of the outgoing Lord Mayor is to present prizes at the City of London School prize day at Guildhall. Other events include those of various law firms, award evenings for the Wine and Spirit Education Trust (WSET), and the banquet for the International Wine and Spirit Competition (IWSC). The Worshipful Company of Carmen holds its Cart-Marking ceremony in the courtyard each July. The Members Bar in the Guildhall is a highly subsidised facility for members of the Court of Common Council and the Court of Aldermen. However access to the facilities becomes a privilege for life even after an individual is no longer a member of either of these courts. Members can also entertain guests there. With spirits available for as little as 60p in October 2017 it is substantially cheaper than any other bar in the City of London. The bar is subsidised from the City's Cash, a sovereign wealth fund originally set up in the 15th century. ^ "The Guildhall", Museum of London. ^ a b c d e Elledge, Jonn. "Like no council canteen you've ever seen: on the drinks menu at the City of London's Guildhall Bar". www.citymetric.com. New Statesman. Retrieved 5 November 2017. This page was last edited on 29 January 2019, at 23:13 (UTC).